The add to/remove from group action is available for use in both &apos;old&apos; and &apos;new&apos; campaigns. In this article, you will learn about the add to/remove from group action, how it can be used, and how to set it up. Much like tags, groups are another way to segment contacts. Groups are primarily useful for Infusionsoft users, as they allow you to segment contacts inside MOBIT in a way that does not show up in Infusionsoft like tags do. For MOBIT users who do not have Infuionsoft, tags and groups are almost identical, the only different being that tags can be achieve campaign goals. 1 - Click on the action button (three vertical dots) to the right of a goal, response goal, timer or rule and select &apos;Add Action&apos;. 2 - Select &apos;Add to/Remove from Group&apos; in the drop-down list of actions. 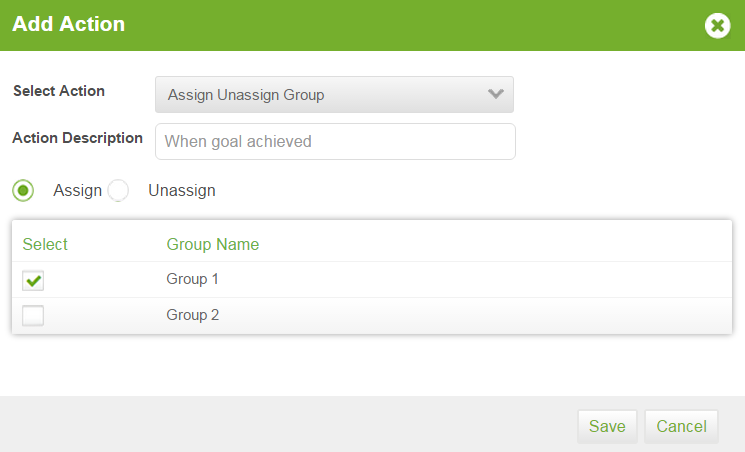 3 - Select whether you would like to assign or unassign your selected group(s) to a contact when your goal is achieved. Select groups by checking the box to the left of their name. Click Save.